A heat gun is a useful small hand tool for a range of tasks. The five best electric heat guns compared and reviewed. A heat gun is a flexible small hand tool - much like a soldering station - and they're used for a wide variety of tasks, both around the home and professionally. Usually powered by electric, they come in various sizes and designs, though all do the same thing - allow you to direct temperature controlled heat at whatever you're needing to work on. The more expensive models are designed for industrial use and those shown here are aimed more in the middle - between home related tasks and moderate professional use. They're especially useful in the winter, for defrosting and ice removal, as well as good for winter prep with regard to draught-proofing windows. Beyond that, they're used for paint removal, hobby and crafting projects, plastic pipe bending, drying epoxy, shrink-wrapping and a whole host of other undertakings. The five best electric heat guns are featured below - all are of a high quality manufacture, best selling and great value for money. This is the best selling heat gun and a breeze to operate - plus the even temperature output speeds up tasks such as paint or varnish removal. It's driven by an ample 12.5 amp motor, has variable heat settings according to the task in-hand and features a dual speed setting. It's comfortable to work with, pretty compact and lightweight, and the kit includes a variety of accessories that offer a good level of flexibility. You get four different jets - plain, reduction, halfond and wide, plus a handle for a scraper, three heads, and a stand. The air temperatures variate between 375 and 495ºC and the adjustable speed is a bonus - especially when face with different tasks. A good quality adjustable heat gun - affordable, well made and highly rated. 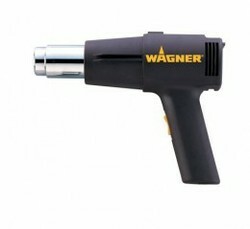 This is an easy to handle paint heat gun - though it can be used for a variety of other heat related tasks. Makes short work of stripping paint from a range of different surfaces - and the heat can be altered between 750F or 1000F. You can use the lower setting for pipe bending, ice removal, or insulating windows in preparation for the winter. The upper heat limit is great for paint and varnish removal, unfreezing stubborn bolts and more. It weighs in at under 2 pounds so it is a little weighty to hold for longer periods but it does feel otherwise balanced and user-friendly overall. This is a popular general purpose model, largely inexpensive at under 25 dollars and if all you need is a good quality broad use heating tool - this is the one for you. This is an incredibly cheap heat gun for what it can do. It's versatile enough, with a good temperature adjustment range - 572 to 1112º degrees, a decent length on the cord - though longer is always better, and it works well across a multitude of tasks. The big compromise re price versus quality seems related to the feel, the design. Weighing in at around 2lbs, which isn't heavy by any stretch, it just feels a little bulky in-hand, a bit under-balanced. Still, that's a small price to pay for the rest of it's features. 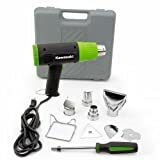 Great for paint removal, unfreezing, shrink-wrapping and more, a cheap and cheerful heat tool that's a steal of a deal and more than worth the purchase price. If you want a full all-round kit that can be applied in a moderate professional environment, then the best affordable industrial heat gun is this one. The kit contains just about everything you'll need for working on a wide range of tasks and the heat settings are higher than previously featured models. You can switch between 1000 and 1500F - which is better for the really stubborn paint removal tasks, plus it comes with a pair of protective nozzles that deflect heat from where it isn't needed. There's a set of three scraper heads and a single scraper with handle, and the whole kit comes in a sturdy enough carry case. Lots of accessories, nice quality, top value for money product. This is the best selling mini heat gun and it does what it says on the box - great for small projects and tasks. It runs off butane, easy to refill and the electronic start works easily enough. It heats up with reasonable speed for such a small tool and will reach a maximum temperature of 1300F. It will last for roughly 15 to 20 minutes on a single fill, or fuel cell, and best of all - it's tiny. Good for shrink-wrapping, defrosting small areas affected by winter weather, hobby crafts and a range of other small works. The heat output is fairly even and unless you hold it almost on top of whatever you're working on (which is always too close with any similar tool) it won't mar the surface with scorch marks. A nice little portable heat gun, affordable, simple and safe to use.